Now that the EmDrive has made its way into the peer-reviewed literature, it falls in range of Tau Zero’s network of scientist reviewers. Marc Millis, former head of NASA’s Breakthrough Propulsion Physics project and founding architect of the Tau Zero Foundation, has spent the last two months reviewing the relevant papers. Although he is the primary author of what follows, he has enlisted the help of scientists with expertise in experimental issues, all of whom also contributed to BPP, and all of whom remain active in experimental work. The revisions and insertions of George Hathaway (Hathaway Consulting), Martin Tajmar (Dresden University), Eric Davis (EarthTech) and Jordan Maclay (Quantum Fields, LLC) have been discussed through frequent email exchanges as the final text began to emerge. Next week I’ll also be presenting a supplemental report from George Hathaway. So is EmDrive new physics or the result of experimental error? The answer turns out to be surprisingly complex. It’s time to weigh in about the controversial EmDrive. I say, controversial, because of its profound implications if genuine, plus the lack of enough information with which to determine if it is genuine. 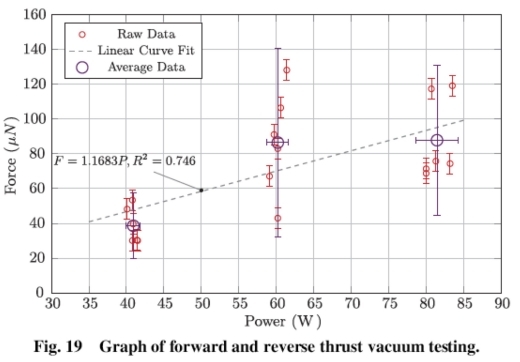 A peer-reviewed article about experimental tests of an EmDrive was just published in the AIAA Journal of Propulsion and Power by Harold (Sonny) White and colleagues: White, H., March, P., Lawrence, J., Vera, J., Sylvester, A., Brady, D., & Bailey, P. (2016), “Measurement of Impulsive Thrust from a Closed Radio-Frequency Cavity in Vacuum,” Journal of Propulsion and Power, (print version pending, online version here. That new article, plus related peer-reviewed articles, were reviewed by colleagues in our Tau Zero network, including two who operate similar low-thrust propulsion tests stands. From our reviews and discussions, I have reached the following professional opinions – summarized in the list below and then detailed in the body of this article. I regret that I can only offer opinions instead of definitive conclusions. That ambiguity is a significant part of this story that also merits discussion. (1) The experimental methods and resulting data indicate a possible new force-producing effect, but not yet satisfying the threshold of “extraordinary evidence for extraordinary claims” – especially since this is a measurement of small effects. (2) The propulsion physics explanations offered, which already assume that the measured force is real, are not sound. (1) If either the EmDrive or Mach Effect Thrusters are indeed genuine, then new physics is being discovered – the ramifications of which cannot be assessed until after those effects are sufficiently modeled. Even if it turns out that the effects are of minor utility, having new experimental approaches to explore unfinished physics would be valuable. (2) Even if genuine, it is premature to assess the potential utility of these devices. Existing data only addresses some of the characteristics necessary to compare with other technologies. At this point, it is best to withhold judgment, either pro or con. (1) The earlier repeated tactic, to attempt fast and cheap experimental tests, has turned out to be neither fast nor cheap. It’s been at least 14 years since the EmDrive first emerged (2002) and despite numerous tests, we still lack a definitive conclusion. (2) In much the same way that thermal and chamber effects are obscuring the force measurements, our ability to reach accurate conclusions is impeded by our natural human behavior of jumping to conclusions, confirmation biases, sensationalism, and pedantic reflexes. This is part of the reality that also needs understanding so that we can separate those influences from the underlying physics. (1) Continue scrutinizing the existing experimental investigations on both the EmDrive and Mach Effect Thrusters. (2) To break the cycle of endlessly not doing the right things to get a definitive answer, begin a more in-depth experimental program using qualified and impartial labs, plus qualified and impartial analysts. The Tau Zero Foundation stands ready to make arrangements with suitable labs and analysts to produce reliable findings, pro or con. Characterize the parameters that affect the effects. Apply those models to (a) assess scalability to practical levels, and (b) understand the new phenomena and its relation to other fundamental physics. On all of the above, conduct and publish the research with a focus on the reliability of the findings rather than on their implications. Our decisions about this physics are influenced by behaviors that have nothing to do with physics. To ignore this human element would be a disservice to our readers. To get to the real story, we need to reveal that human element so that we can separate it from the rest of the data, like any good experiment. I’m starting off with this issue so that you are alert to its influences before you read the rest of this article. As much as I strive to be impartial, I know I have an in-going negative bias on the EmDrive history. To create a review that reflects reality, rather than echoing my biases, I had to acknowledge and put aside my biases. Similarly, if you wish to extract the most from this article, you might want to check your perspectives. Ask yourself these three questions: (1) Do you already have an opinion about this effect and are now reading this article to see if we’ll confirm your expectation? (2) Do you want to know our conclusions without any regard to how we reached those conclusions? (3) Are you only interested in this EmDrive assessment, without regard to other comparable approaches? If you answered “yes” to any of those questions, then you, like me, have natural human cognitive dysfunctions. To get past those reflexes, start by at least noticing that they exist. Then, take the time to notice both the pros and cons of the article, not just the parts you want to be true. Deciphering reality takes time instead of just listening to reflexive beliefs. It requires that one’s mind be open to the possibility you might be right and equally open to the possibility you might be wrong. Shawyer’s device and supporting equipment are on a rotating frame, where that rotation is used to determine if the device is thrusting. Note, however, the radiator and coolant lines. Any variation in the coolant flow would induce a torque that would obscure any real force measurements. Knowing the claimed thrusting effect is small and having enough experience to guess the likely variations in coolant flow, I considered this test set-up flawed. Juan, Y., et al, (2012). Net thrust measurement of propellantless microwave thrusters. Acta Physica Sinica, Chinese Physical Society. Assumes first that the EmDrive is genuine. Verbally describes theory, but without predicting experimental findings. The experiment is not described in enough detail to assess its fidelity, but is similar to the one in the photo. Regardless, there is absolutely no discussion of possible influences on the rotation from tilting, power lead forces, vibration effects, thermal effects, or others. The behavior of the thrust stand was not characterized before installing the EmDrive. Testing the two together without first having characterized the thrust stand separately prevents separating their distinct characteristics from the data. The data plots lack error bands. Juan, Y., et al (2013). Prediction and experimental measurement of the electromagnetic thrust generated by a microwave thruster system. Chinese Physics B, 22(5), 050301. 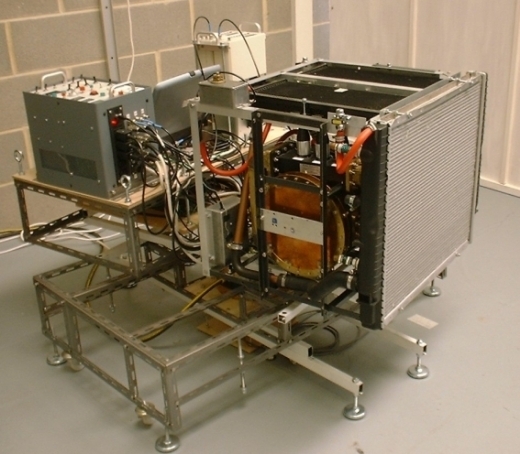 The description of the experiment is improved from the 2012 paper and appears to be the same configuration. This time possible effects from tilting and the power lead forces are mentioned, but they still do not address vibration, thermal, coolant loop, or other effects. Again, they fail to characterize the thrust stand separately from the EmDrive. Unlike the 2012 paper, they attempt to make numerical predictions. Details are provided for their physics derivations (which I did not scrutinize). That theory is then applied to make predictions for their specific hardware, but only verbally described it, rather than showing an explicit derivation. They show plots of the predicted force versus power, but only up to 200W, where the experimental runs span about 100W to 2400W. The experimental results do not match their linear predictions for the ratio of force-to-power. These differences are then evasively dismissed. Juan, Y., et al. (2016), “Thrust Measurement of an Independent Microwave Thruster Propulsion Device with Three-Wire Torsion Pendulum Thrust Measurement System,” Journal of Propulsion Technology, vol. 37, no. 2, pp 362-371. From figures 2, 3, 6, 7, 16, and 19, it appears the prior apparatus is now hung from torsion wires instead of a rotating support from below. This time the coolant loop is explicitly shown, but in a conceptual drawing instead of showing specifics. Again, the influence of the coolant loop is ignored. The only “measurement results” plot is “force versus serial number” – which conveys no meaningful information (without being able to read associated text). I learned later from Martin Tajmar, that the observed thrust drops by more than an order of magnitude when the device is powered by batteries instead of the external cables (cables whose currents can induce forces). I chose not to cite and comment on the many non-peer-reviewed articles on Shawyer’s website and related AIAA conference papers. Shawyer eventually published a peer-reviewed article, specifically: Shawyer, R. (2015), “Second generation EmDrive propulsion applied to SSTO launcher and interstellar probe,” Acta Astronautica, vol. 116, pp 166-174. Shawyer states: “Theoretical and experimental work in the UK, China and the US has confirmed the basic principles of producing thrust from an asymmetric resonant microwave cavity.” That assertion has not held up to scrutiny. Therefore, all related assertions are equally unfounded. Instead of offering substantive evidence, this article instead predicts the performance for three variations of EmDrives that now claim to use superconductivity. From these, he presents conceptual diagrams for their respective spacecraft. He also mentions the “Cannae Drive,” by Guido Fetta, as another embodiment of his device. The latest paper, in the AIAA Journal of Propulsion and Power, is an improvement in fidelity on the prior tests and may be indicative of a new propulsive effect. However, the methods and data are still not crossing the threshold of “extraordinary evidence for extraordinary claims” – especially since this is a measurement of small effects. With the improved fidelity of the reporting and the data traces themselves, I have to question my earlier bias that the prior data was entirely due to experimental artifacts and proponent biases. The assessment offered below is a summary of discussions with the coauthors of this report plus a few other colleagues. Both Martin Tajmar and George Hathaway operate similar low-thrust propulsion test stands and thus are familiar with such details. George Hathaway’s more focused analysis will be posted in a future Centauri Dreams article. The major problems with the paper are (1) lack of impartiality, (2) the test hardware is not sufficiently characterized to separate spurious effects from the test article’s effects, (3) the data analysis is marred by the use of subjective techniques, and (4) the data can be interpreted in more than one way – where one’s bias will affect one’s conclusions. The first shortcoming of the paper is that it is biased. It assumes that the propulsion effect is genuine and then goes on to invent an explanation for that unverified effect. This bias skews how they collect and analyze the data. To be more useful, the paper should have reported impartially on its experimental and analytical methods to isolate a potential new force-producing effect from other contaminating influences. Thrust stand tilting: The thrust stand has a vertical axis, where even slight changes of that alignment will affect how the thrust stand behaves. There are three parts to this, none of which are quantified: the fidelity of the thrust stand flexures and pivots, the alignment fidelity of that structure to the vacuum chamber, and the sustained levelness of the “optical bench” upon which the vacuum chamber is mounted. Thrust stand characterization: The thrust stand does not return to its original position after tests, even for most calibration events. Additionally, the thrust stand is over-damped, meaning that it is slow to respond to changes, including the calibration events. Those characteristics (time for the thrust stand to respond to a known force and the difference between its before/after positions) are important to understand so that those artifacts can be separated from the data. These facets are largely ignored in the paper. The report does mention that the location of the masses on the thrust stand affects its response rate (“split configuration” versus “non-split”), but this difference is not quantified. The thrust stand uses magnetic dampers. Similar dampers used on one of Martin Tajmar’s thrust stands were found to cause spurious effects (subsequently replaced with oil dampers). Given the irregular behavior, it is fair to suspect that other causes are interfering with the motion of the thrust stand. The flexural bearings might be operated beyond their load capacity or might be affected by temperature. Forces from power cables: To reduce the influence of electromagnetic forces from the power leads, Galinstan liquid metal screw and socket connections are used. While encouraging, it is not specified if these connections (several needed) are all coaxially aligned with the stand’s rotation axis (as required to minimize spurious forces). Also, there are no tests with power into a dummy load to characterize these possible influences. Chamber wall interactions: Though mentioned as a possible source of error, the electromagnetic forces between the test device and the vacuum chamber walls are dismissed without quantitative estimates or tests. One way that this could have been explored is by using more variations in the position and orientation of the test device relative to the chamber. For example, in the “null thrust” configuration, only one of four possibilities is used (the device pointed toward the pivot axis). If also pointed up, down, and away from the pivot, more information would have been collected to help assess such effects. Thermal effects: The paper acknowledges the possible contributions from thermal effects, but does not quantify that contribution. For example, there are no measurements of temperature over time compared to the thrust stand’s deflection. Such measurements should have been made during operation of the device and when running power through a dummy load. Absent that data, the paper resorts to subjectively determining which parts of the data are thermal effects. For example, without any validation, the paper assumes that the displacement measured during the “null thrust” configuration is entirely a thermal effect. It does not consider chamber wall interactions or any other possible sources. 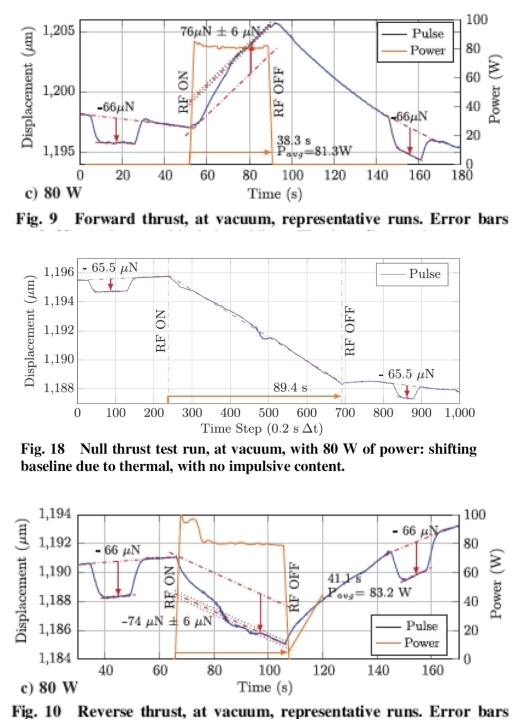 The paper does speculate that temperature changes might shift the center of gravity of the test article in a way that affects the thrust stand, but no diagrams are offered showing how a slight change in one of those dimensions would affect the thrust stand. The third and most egregious shortcoming in the report is that they apply a vaguely described “conceptual simulation” (which is never mathematically detailed) as their primary tool to deduce which part of the data is attributable to their device and which is due to thermal effects. They assume a priori the shapes of both the “impulsive thrust” (their device) and thermal effects and how those signals will superimpose. There is no consideration of chamber wall effects, power lead forces, tilting, etc. As a reflection of how poorly defined this assumed superposition, the ‘magnitude’ and ‘time’ axes on the chart showing this relation (Fig. 5) are labeled as “arbitrary units.” Another problem is that their assumed impulsive thrust curve does not match the shape of most of the data that they attribute to impulsive thrust. Instead of the predicted smooth curve, the data shows deviations about halfway through the thrusting time. They then apply this subjective and arbitrary tool to reach their conclusions. Because they are biased that the effect is genuine and because their methods overlook critical measurements, I cannot trust the authors’ interpretations of their results. Absent an adequate accounting for the magnitude and characteristics of secondary causes and how to remove those possible influences from the data, the fourth major problem with the report is that its data can then be interpreted more than one way. Rather than evoking subjective techniques here, the comments that follow are based only on examining their data plots as a whole. To illustrate how this data can then be interpreted in more than one way, both dismissive and supportive interpretations are offered. 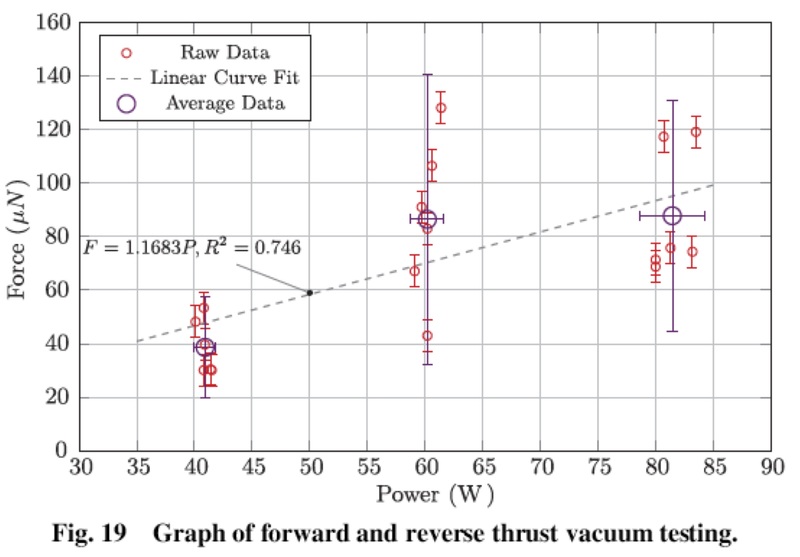 In particular, we compare the traces from the “forward,” “null,” and “reverse” thrust configurations and then the force versus power compilation of the runs. The data for the 80W operation of the device in the “forward,” “null,” and “reverse” thrust configurations is presented in Figures, 9c, 18, and 10c, respectively. Recall from the above discussions that this data includes all the uncharacterized spurious causes (thermal, chamber wall interactions, power lead forces, tilting of the thrust stand, and seismic effects), plus any real force from the test device. The values shown in the table below were read from enlarged versions of the figures. For a genuine thrusting effect, one would expect the results to show near-matching magnitudes for forward and reverse thrust and a zero magnitude for the null-thrust orientation. If one looks only at the “Total deflection,” all the magnitudes are roughly the same, including the null-thrust. Pessimistically, one could then infer that the spurious effects are great enough to be easily misinterpreted as a genuine thrust. Conversely, if one considers how quickly the deflections occur, then the attention would be on the “Rate of deflection.” In that case, the thrusting configurations are roughly twice as large as the null-thrust configuration. From only that, one might infer that a new force-producing effect is larger than spurious causes. To infer conclusions based on the deflection rates, one must also examine the rate of deflection for the calibration events, which should be the same in all configurations. The calibration deflection rate appears roughly the same in the forward and reverse thrust configuration, but more than 2.5 times larger in the null thrust configuration. That there is a difference compounds the difficulty of reaching conclusions. There are also significant inconsistencies with how the thrust stand rebounds once the power is turned off between the thrusting and null-thrust configurations, again compounding the difficulty of reaching conclusions. Because a possible positive interpretation exists within those different perspectives, I cannot rule out the possibility that the data reflects a new force-producing effect. But as stated earlier, given all the uncharacterized secondary effects and the questionable subjective techniques used in the report, this is not sufficient evidence. Given the prominent role played by the rate of deflections, the dynamic behavior of the thrust stand must be more thouroughly understood before reaching firm conclusions. Next, let’s examine the compilation of runs, namely Fig. 19. Based on a linear fit through the origin with the data, they conclude a thrust-to-power ratio of 1.2 ± 0.1 mN/kW (=µN/W). While this is true, the data can be interpreted more than one way. Note that the averages for 60 and 80 watts operations are the same, so a linear fit is not strictly defensible. One could just as easily infer that increasing power yields decreasing thrust, a constant 50 µNewton force, or an exponential curve that flattens out to a constant (saturated) thrust of about 100 uN. Note too that the null-thrust data (which could be interpreted to be as high as 211 µN) is not shown on this chart. Recall too that they did not quantify the potential spurious effects, so their presumed error band of only ±6 µN does not stand up to scrutiny. Note, for example, the span in the 40W data is about ± 17µN, the 60W about ± 50µN, and the 80W about ± 32µN. What is not clear is if these 40, 60, and 80 Watt runs represent different operating parameters (Q-factor? ), or if instead, these are the natural variations with fixed settings. The pessimistic interpretation is that the deviations in the data represent variations for the same operating conditions, in which case the data are too varied from which to conclude any correlations. Conversely, the optimistic interpretation is to assume the variations are due to changes in operating parameters, but then that additional information should be made available and be an explicit part of the analysis. In summary, this most recent report is a significant improvement, but has many shortcomings. Questionable subjective techniques are used to infer the “thrust” from the data. Other likely influences are not quantified. But also, despite those inadequacies, the possibility of a new force-producing effect cannot be irrefutably ruled out. This is intriguing, but still falling short of defensible evidence. First, I cannot stress enough that there is no new EmDrive “effect” yet about which to theorize. The physical evidence on the EmDrive is neither defensible nor does it include enough operating parameters to characterize a new effect. The data is not even reliable enough to deduce the force-per-power relationship, let alone any other important correlations. What about the effects of changing the dimensions or geometry, changing the materials, or changing the microwave frequencies or modulation? And then there is the unanswered question, what are the propulsion forces pushing on? Assuming for the moment that the EmDrive is a new force-producing effect, we know at least two things (1) it is not a photon rocket, because the claimed forces are 360 times greater than the photon rocket effect, and (2) a force, without an “equal and opposite force,” goes beyond Newton’s laws. Note that I did not evoke the more familiar “violating conservation of momentum” point. That is because these experiments are still trying to figure out if there is a force. We won’t get to conservation of momentum until after those forces are applied to accelerate an object. If that happens, then we must ask what reaction mass is being accelerated in the opposite direction. If the effects are indeed genuine, then new physics is being discovered or old physics is being applied in a new, unfamiliar context. For those claiming to have a theory to predict a new propulsion effect, it is necessary that those theories make testable numeric predictions. The predictions in Juan’s 2013 paper did not match its results. The analytical discussions in White’s 2016 experimental paper do not make theoretical predictions. The same is true with his 2015 theoretical paper: White (2015), “A discussion on characteristics of the quantum vacuum,” Physics Essays, vol. 28, no. 4, 496-502. Short of having a self-consistent theory, any speculations should at least accurately echo the physics they cite. The explanations in the White’s 2016 experimental paper, White’s 2015 theory paper, and even White’s 2013 report on the self-named “White-Juday Warp Field Interferometer” (White (2013), “Warp Field Mechanics 101,” Journal of the British Interplanetary Society, vol. 66, pp. 242-247), did not pass this threshold. I’ll leave to other authors to elaborate on the 2015 and 2016 papers, while a review of the 2013 warp drive claims is available here. It is Lee & Cleaver (2014), “The Inability of the White-Juday Warp Field Interferometer to Spectrally Resolve Spacetime Distortions,” [physics.gen-ph]. In contrast, it is also important to avoid pedantic reflexes – summarily dismissing anything that does not fit what we already know, or assuming all of our existing theories are completely correct. For example, the observations that lead to the Dark Matter and Dark Energy hypotheses do not match existing theories, but that evidence has been reliably documented. Using that data, many different theories are being hypothesized and tested. The distinction here is that both the proponents and challengers make sure they are accurately representing what is, and is not yet, known. If a propulsion physics breakthrough is to be found, it will likely be discovered by examining relevant open questions in physics. A relevant theoretical question to non-rocket propulsion concepts (including the EmDrive) is ensuring conservation of momentum. One way to approach this is to look for phenomena is space that might serve as a reaction mass in lieu of propellant, perhaps like the quantum vacuum. Another approach is to dig deeper into the nature of inertial frames. Inertial frames are the reference frames upon which the laws of motion and the conservation laws are defined, yet it is still unknown what causes inertial frames to exist or if they have any deeper properties that might prove useful. Woodward, James F. (1990), “A new experimental approach to Mach’s principle and relativistic gravitation,” Foundations of Physics Letters, vol. 3, no. 5, pp. 497-506. Woodward, James F. (2013) Making Starships and Stargates: The Science of Interstellar Transport and Absurdly Benign Wormholes. Springer Praxis Books. Experiments have been modestly underway for years, including three recent independent replication attempts by George Hathaway in Toronto Canada, Martin Tajmar in Dresden Germany, and Nembo Buldrini in Wiener Neustadt, Austria. A workshop was held to review these findings in September 20-23, 2016, in Estes Park, Colorado. I understand from an email conversation with Jim Woodward that these reports and workshop proceedings are now undergoing peer review for likely publication early in 2017. The main point here, by citing just this one other example, is that there are other approaches beyond the highly publicized EmDrive claims. It would be a disservice to our readers to let a media fixation with one theme blind us to alternatives. If either the EmDrive or Mach Effect Thruster is indeed genuine, then new physics is being discovered or old physics is being applied in a new, unfamiliar context. Either would be profound. Today it is premature to assert than any of these effects are genuine, or conversely, to flatly rule out that such propulsion ambitions are impossible. When the discussions are constrained to exclude pedantic disdain and wishful interpretations, and limited to people who have either the education or experience in related fields, one encounters multiple, even divergent, perspectives. Next, even if new physics-to-engineering is emerging, it is premature to assess its utility. The number of factors that go into deciding if a technology has an advantage over another are way beyond what data is yet available. Recall that the performance of the first aircraft, jet engine, transistor, etc, were all tiny examples of what those breakthroughs evolved to become. Reciprocally, we tend to forget about all the failed claims who have faded into obscurity. We just do not know enough today, pro or con, to judge. I realize the urge within human behavior for fast, definitive answers that we can act on. This lingering uncertainty is aggravating, even more so when peppered with distracting hype or dismissive disdain. To get to the underlying reality, we must continue with a focus on the fidelity of the methods to produce reliable results, rather than jumping to conclusions on the implications. If you want definitive answers, then we must improve the reliability of the methods and data, and remain patiently open for the results to be as they are, good news or bad news. I alluded earlier to the broken tactic of trying to get answers with fast and cheap experiments. How many inadequate experiments and over how many years does it take before we change our tactics? I’ve had this debate more than once with potential funding sources and I hope they are reading now to see… “I told ya so!” Sorry, I could not resist that human urge to emotionally amplify a well-reasoned point. To break the cycle of endlessly not doing the right things to get a definitive answer, we must begin a more in-depth experimental program using qualified and impartial labs, plus qualified and impartial analysts. Granted, those types of service providers are not easy to find, where impartiality is the hardest to come by. Also, it might take three years to get a reliable answer, which is at least better than 14 years. And the trustworthy experiments will not be cheap, but quite likely far less than the aggregate spent on the repeated ‘cheap’ experiments. If any of those prior funding sources (or new) are reading this and finally want trustworthy answers, contact us. Tau Zero stands ready to make arrangements with suitable labs and analysts to conduct such a program. 1. Characterize the parameters that affect the effects. Instead of just testing one design, vary the parameters of the device and the test conditions to get enough information to work with. 2. Deduce mathematical models from that more complete set of information. 3. Apply those models to (a) assess scalability to practical levels, and (b) explore the new phenomena and its relation to other fundamental physics. 4. On all of the above, conduct and publish the research with a focus on the reliability of the findings rather than on their implications. For those of you who are neither researchers nor funding sources, what should you do? First, before reposting an article, take the time to see if it offers new and substantive information. If it turns out to be hollow click-bait, then do not share it. If it has both new information with meaningful details, then share it. Next, as your read various articles, notice which sources provide the kind of information that helps you understand the situation. Spend more time with those sources and avoid sources who do not. When faced with uncertain situations and where the data is unreliable, the technique I use to minimize my biases is to simultaneously entertain conflicting hypotheses, both the pro and con. Then, as new reliable information is revealed, I see which of those hypotheses are consistent with that new data. Eventually, after enough reliable data has accrued, the reality becomes easier to see. The cited devices have gone by multiple names (e.g. EmDrive, EM Space Drive; Mach Effect Thruster, Mach-Lorentz Thruster), and the versions used in this article are the ones with the greatest number of Google search hits. these Proceedings, were undertaken to establish condence in the signals reported. Explanation of Roger Shawyer is very simple ( Roger Shawyer Explaining The Basic Science behind #EmDrive, https://www.youtube.com/watch?v=wBtk6xWDrwY ), but I think perhaps it can be a bit detailed. Work of the EmDrive engine (if it works) does not violate any physical lows. Sure Emdrive engine looks like closed system and furthermore it looks like a jet and so it can seem we can require some exhaust or ‘opposite reaction’. Actually volume of the cavity can be closed, but obviously this cavity can be pushed or pulled like a stone by some force. Stone can be accelerated by some force and cavity can be accelerated by some force. Thus both stone and the cavity are open for some force, i. e. both stone and the cavity can form with some force an open system ( pic. “Independent of velocities” at the time moment 3.13 of the mentioned video, approximately). Stone can be accelerated for example by gravitational field; cavity can be accelerated both by gravitational field and by the force created by electromagnetic waves (or microwaves for simplicity). Microwaves can run any anywhere, for example they can run within the cavity with closed volume. But in spite of closed volume of the cavity microwaves velocities do not depend on the cavity velocity ( pic. “Independent of velocities” at the time moment 3.13 of the mentioned video, approximately). Independence of the microwaves velocities of the cavity velocity is very similar to the second postulate underlying the special relativity theory (‘the speed of light in vacuum is the same for all observers…’, https://en.wikipedia.org/wiki/Theory_of_relativity ). It is true for microwaves too. Light velocity can depend on refractive index of the medium, microwaves velocities can depend on refractive index of the medium, cavity dimensions and its shape (due to relatively big wavelengths of the microwaves) but in spite of the multiple reflections from the sides of the cavity should not depend on the cavity velocity. We know that the both light and any microwaves carry energy or mass as energy equivalent and can create a pressure. As far as I understand two microwaves run within the cavity in opposite directions with different (due to specific shape of the cavity) so called group (or “real”) velocities (independent of the cavity velocity) and create some resulting force that accelerates the cavity. During this acceleration microwaves by means of this resulting force give momentum to the cavity. Momentum increase is derived from Newton’s second low ( https://en.wikipedia.org/wiki/Momentum ) and thus momentum increase of the cavity is due to its acceleration. Acceleration of the cavity is very similar to the simple acceleration of the dropping stone accelerated by gravitation field of the earth. Thus Newton’s second law of motion is not violated. I think that the work of the Emdrive engine (if it works) can be considered as an excellent confirmation both of the second postulate underlying the special relativity theory and of the special relativity theory itself and simultaneously it can be considered as an excellent confirmation of the Newton’s second law too. I think that the Emdrive engine is really brilliant invention as results of a few theories (relativity theory, microwaves theory, Newton’s second law) are concentrated in the design of the cavity that looks like a simple bucket, but sure this bucket is properly designed. I think it is really ‘beautiful combination’ and I think Roger Shawyer should be awarded by Nobel or some another similar prize. I think Doppler shift ( https://en.wikipedia.org/wiki/Doppler_effect ) of the microwaves running within the cavity can be considered as ‘opposite reaction’ of the Emdrive engine acceleration. By the way Doppler shift can be considered as the part of the relativity theory under small velocity changes. Microwaves velocities should not depend on the cavity velocity (Roger Shawyer Explaining The Basic Science behind #EmDrive, https://www.youtube.com/watch?v=wBtk6xWDrwY, pic. “Independent of velocities” at the time moment 3.13 of the video, approximately), but microwaves frequencies or wavelengths must be shifted for unmoved (or moved with constant velocity) observer due to Emdrive engine acceleration. If we assume that microwaves have an energy and according to the relativity theory ( https://en.wikipedia.org/wiki/Theory_of_relativity have a mass as energy equivalent we can assume that Doppler shift is equivalent to this mass changing, this mass changing can affect the momentum. For example energy and momentum of the photons obviously depend on photon frequency (or wavelength). Doppler shift is proportional to the velocity shift, coefficient of the proportionality is approximately same for microwaves running within the cavity in the opposite directions, but group (or “real”) velocities of the microwaves running within the cavity in opposite directions can be different due to specific shape of the cavity. Different group (or “real”) velocities of the microwaves running within the cavity in opposite directions creates a force accelerating the cavity, Doppler shift due to cavity acceleration can affect the total momentum of the microwaves running within the cavity. Perhaps it is ‘opposite reaction’ or ‘exhaust’ of the Emdrive engine acceleration and this ‘opposite reaction’ (or ‘exhaust’) is also located within the cavity. Thus Newton’s third law for Emdrive engine should be true too.